One of the oldest Arabic Jewish physicians, and the oldest translator from the Syriac; lived in Bassora about 883. His name, mutilated in every possible way, has been transmitted in European sources; nor has it yet been satisfactorily explained.Neuda (in "Orient, Lit." vi. 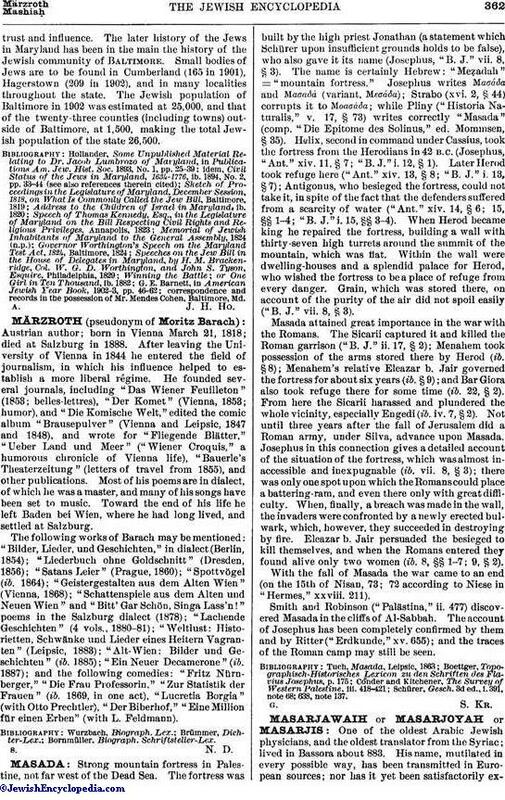 132) compares the name "Masarjawaih" with the Hebrew proper name "Mesharsheya"; but the ending "-waih" points to a Persian origin. 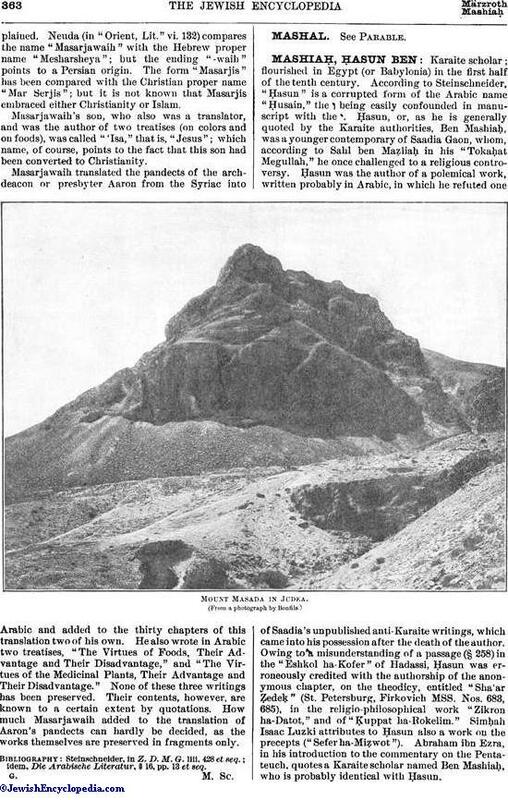 The form "Masarjis" has been compared with the Christian proper name "Mar Serjis"; but it is not known that Masarjis embraced either Christianity or Islam. Masarjawaih's son, who also was a translator, and was the author of two treatises (on colors and on foods), was called "'Isa," that is, "Jesus"; which name, of course, points to the fact that this son had been converted to Christianity. Masarjawaih translated the pandects of the archdeacon or presbyter Aaron from the Syriac into Arabic and added to the thirty chapters of this translation two of his own. He also wrote in Arabic two treatises, "The Virtues of Foods, Their Advantage and Their Disadvantage," and "The Virtues of the Medicinal Plants, Their Advantage and Their Disadvantage." None of these three writings has been preserved. Their contents, however, are known to a certain extent by quotations. How much Masarjawaih added to the translation of Aaron's pandects can hardly be decided, as the works themselves are preserved in fragments only. idem, Die Arabische Literatur, § 16, pp. 13 et seq.